I started playing taiko when I was 12, when my parents and I all signed up for a beginning taiko class with Shinsho Mugen Daiko. While at first it was just something fun to do with my parents, I soon found it provided a physical and mental challenge that school, and later working as a hardware engineer, could not. 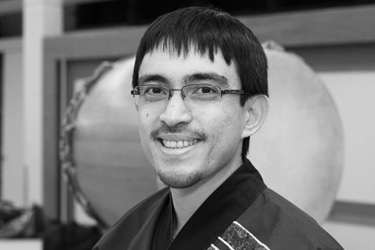 Taiko has been a great way for me to connect to new communities whenever I changed location; the shared experience of learning and performing together, combined with the powerful sound of the taiko, helped create connections that were otherwise difficult for me. I spent four years in Colorado Springs after college, playing with the newly formed Taiko Society, before moving to Portland in 2016. I started taking classes with Portland Taiko that year and became a trainee in 2017. I look forward to many new adventures with Portland Taiko!